Submitted by Jeff Buster on Sun, 01/14/2007 - 18:39. Here is where Mr. Stuebi, Mr. Richards, The Cleveland Foundation, the Cuyahoga County Commissioners and NEO should start with their wind turbine aspirations. Let’s organize NEO businesses and train NEO workers to competitively make the components for wind turbines. Let’s start with the NUTS & BOLTS - not turbines on Lake Erie! 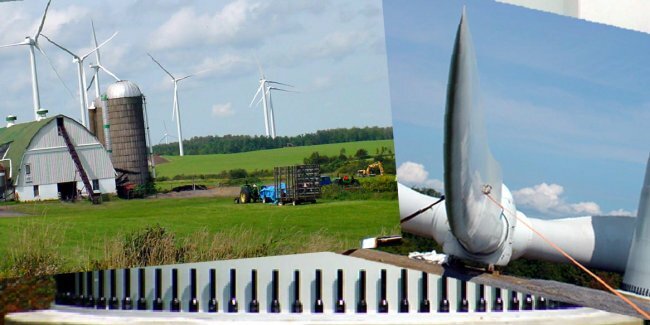 The Dyson Corporation, of Painesville, Ohio http://www.dysoncorp.com/products.html produced the bolts which secure this turbine tower to its foundation in the Maple Ridge Wind Farm near Watertown, New York. There are over 200 turbines in the wind farm over rolling ex-dairy pasture. Though the 1.65 megawatt turbines are produced in Europe by Vestas, at least Ohio was competitive enough to get a minor piece of the manufacturing pie. Hat’s off to DYSON. Would you agree it is worth doing both and more? Submitted by Norm Roulet on Sun, 01/14/2007 - 20:14. I think everyone will agree with you on that, but what I see is a significant movement toward what you recommend and much more - pulling $100 million into the region for research and development and engineering and experimentation and test deployments - the proposal as I see it is there would be 3rd Frontier and federal and foundation money spent along with industry investment plus free market enterprise, all focused on wind and other alternative energy. Add to that a pro alternative state and fed government movement and all things are possible here - we need to go after everything right now! Submitted by Jeff Buster on Sun, 01/14/2007 - 20:38. PERMANENT JOBS FIRST! For NEO the primary objective in adopting wind turbines must be to drive permanent manufacturing employment and permanent service employment. Wind turbines in the lake will produce very few local construction jobs, and almost no permanent jobs whatsoever. TURBINES ON WATER COST TWICE AS MUCH as THOSE ON LAND It was also a cause for alarm because installing turbines in a marine environment is TWICE AS COSTLY – because of the many specialized and sophisticated engineering challenges - per megawatt as land installation. NO INTERNATIONAL PLANNING PROTOCALS EXIST FOR PUBLIC TRUST WINDS Before ANY wind turbines are installed in the Great Lakes there must be protocols established with the 8 US states and 2 Canadian provinces which border the Lakes. Like cell phone and radio spectrum leases, and offshore and onshore oil and gas leases, the winds belong to the public and, along with planning the physical layout of turbine farms, there must be equitable processes to allow the development of public water based turbine "electric utilities" while simultaneously rewarding the public financially. NEWBORN BABY ON A UNICYCLE Installing marine turbines as NEO’s inauguration into the wind turbine business is as nonsensical as perching a newborn baby on a unicycle seat – and letting baby test his balance - before baby can even crawl. Let’s see if NEO can copy the Bowling Green Municipal Electric cornfield based wind turbine development model first. COUNTY DEVELOPMENT MONEY SHOULD BE SPENT FIRST ON JOB SKILL TRAINING – NOT ON TURBINES and TOWERS MADE OVERSEAS AND CONSTRUCTION MONEY NEO WILL NOT RETAIN. One of the most straightforward and simple of the components in a wind turbine is the steel tower – and the job skill level and manufacturing expertise in NEO is so absent that NEO can’t even manufacture a competitive tower. In 2005 Martha Eakin and I hosted a symposia at Case’s Weatherhead Regional Economic Initiatives Institute, under the auspices of then Director Ed Morrison, with invited engineering representatives from Lincoln Electric and manufacturing representatives from Cleveland’s American Tank (heavy plate fabrication) in attendance. The discussion centered on why steel support towers for the Bowling Green wind farm were manufactured in South Korea. Yes, that’s the sad truth – If NEO is ever to become a force in wind energy, then Lincoln Electric, and our local heavy metal fabricators need to be able to be competitive in steel tower manufacturing. Right now Ohio can’t even build a steel tower to the tolerances required by Vestas or Gamesa, not to even mention building a tower at a competitive price. NOT THINKING REGIONALLY ENOUGH When it finally does come time to place wind turbines in Lake Erie, they should be placed first off Toledo – where the wind energy is considerably greater than off of Cleveland. How do we move dialog to right level? Submitted by Norm Roulet on Sun, 01/14/2007 - 20:49. I agree with all your points... we're finally getting back to the level of dialog we had back in the REI days. So it seems important that right now there needs to be a serious open dialog about wind - get everyone to share their perspectives and expertise and build networks to get the most valuable outcomes the most quickly... especially if there is to be any public subsidy. What do you think? Submitted by Charles Frost on Sun, 01/14/2007 - 23:18. I had the extreme pleasure of hearing Dr. Majid Rashidi, from the Mechanical Engineering Dept. at Cleveland State, talk at the Kirtlandia Society meeting at the Cleveland Museum of Natural History yesterday. His idea for a building integrated system of small (read "easily and safely maintained") wind turbines is a really great idea. He has really done his homework on this one!!! Most importantly,however,in my opinion, is the fact that his main design focus has been on the manufacturing of the system. He is looking at local fiberglass manufacturers for the spiral body, standard steel materials for the internal framework, regular local labor for the construction (not imported labor), and basic "off the shelf" wind turbines. They have already raised the funds for the installation of a demonstration project somewhere on the CSU campus. Is this the future breezing into town? It seems only fitting that the man who agreed to lead a struggling urban university at age 64 would now want to put a windmill on its campus. But when the man is Michael Schwartz and the institution Cleveland State University, Don Quixote analogies quickly crumble. For one thing, CSU's president isn't talking about a typical three-blade structure like the one that now stands by the Great Lakes Science Center. For another, he expects it to carry far more than symbolic value; ideally, this SmartEnergy Spire eventually will blow lots of dollars directly toward CSU's bottom line. "It's a terrific idea," he says, beaming at a desk- sized model of the device that he's kept in his office since learning about the technology. It's also terrifically well-timed. Spiraling energy prices have spurred unprecedented interest in alternative energy options in areas across the country, and specifically in Northeast Ohio. President Bush directed millions in new money toward solar and wind power in the 2007 budget, and federal applications for wind turbines have more than doubled over the last two years. Meanwhile, Cuyahoga County's commissioners appointed a task force this summer to consider alter native energy strategies, starting with an examination of wind power. But with only about 6 percent of the United States' land mass appropriate for construction of traditional wind turbines - typically as tall as a downtown skyscraper - opportunities are huge for those who can turn innovative designs into reliable and efficient machines. A San Diego company, for example, is plugging a model that has four spinning rotors floating roughly 15,000 feet in the air, while scholars at the Massachusetts Institute of Technology and Johns Hopkins University each offer unique designs to allow wind turbines to stand far out at sea. Into this heated competition comes CSU engineering professor Majid Rashidi, a man whose passion for product design yielded three patents in just six years. When Akron-area entrepreneur Mark Cironi was looking for someone to make a vague idea reality, Cleveland experts paired him with Rashidi. The professor, whose past inventions have been on a far smaller scale - for example, a device to test for leaks in a catheter - soon was hooked by the challenge of creating an entirely new way to capture the wind. Traditional wind turbines require huge open space. They also are costly to maintain because of the height of the gearbox and massive strain placed on it by translating the energy of giant, turning blades into significant electrical power. Replacing one big rotor with bunches of smaller ones addressed key maintenance concerns. Still unanswered, however, was the larger question: how to persuade the wind to travel in such a way as to increase its speed? As on the TV game show "Jeopardy," Rashidi's answer ultimately came in the form of a question: "What if I made it like a screw?" Because the device is round, it doesn't have to turn to "chase" the wind, like a traditional windmill. Because it can be built in perfectly similar segments, transport is not nearly as complex as it is when ferrying blades that can stretch longer than a football field. Finally, because rotors sit inside the curves, blades are not as susceptible to rain and snow. CSU has a provisional patent for Rashidi's design, and Cironi and the professor have touted it to nearly anyone who will listen - politicians, business people and, of course, university leaders. Academic institutions have been among the nation's leaders in pursuing alternative energy sources; the University of Pennsylvania, for example, gets nearly a third of its power from wind, while several Minnesota colleges have erected traditional wind turbines on their campuses. Officials at the University of Akron have explored placing multiple spires on its campus, although they'll need substantial funding to make the idea happen. Richard Stuebi, the Cleveland Foundation's BP Fellow for Energy and Environmental Advancement, says the spire targets a new market, the urban niche. But as promising as the spire sounds in theory, the performance of an actual structure over time is what matters most to potential investors. It's hard to know if it's going to be a winner," Stuebi said, "but it could be a winner." Cironi says he has sold five of the structures to a Pennsylvania customer already, but CSU will get the very first spire produced. Schwartz is confident of securing funding and already plans for the model to sport the university's green-and-white colors. "It makes the statement," the president says, "that this technology was created at CSU." Sheridan is an associate editor of The Plain Dealer's editorial pages. put those bird grinders over DIRT and dont faulk up our VIEW! Submitted by Zebra Mussel on Mon, 01/15/2007 - 00:58. If you are opposed to putting the turbines on the lake, why not jump on the bird hugger band wagon and work that angle. I bet you could drum up outrage from some Audobon in CLE. This strategy works out west, fairly well... at least in generating bad press and increasing / unifying the ranks of those opposed. Dike 14 is supported by lots of bird huggers.... yet that big ol dike is also supported by organizations which support putting spinning blades known to inflict harm on avian species out on our lake. Ironic isnt it? That is not such a big factor for me, personally. For me turbines on the lake would be a god aweful sin akin to visual pollution. Dont go obstructing the ONLY unobscured stretch of vista we have in NE Ohio, on the largest piece of public property (the lake is waters of the state) she is our largest expanse of wilderness for a long way in all directions. You want to build in our WILDERNESS? wil·der·ness - any desolate tract, as of open sea. Why torque out our panarama with visual pollution. The value of our vista is a soft cost that is being swept up under the rug and externalized. IMHO. How much is it worth to you and every other citizen of Whiskey Island, and Cleveland Ohio to have a uncluttered view of the sun set over our great lake? I grew up 1/2 a block from the shore in Euclid near 260th... I grew up to love sunsets on our lake. I taught my daughter to love them, and I will teach my son one day to love them as well... just as both my mother and fathers parents taught them to love the lake and her sunsets from the beaches at Grovewood Club and Dalwood Drive, north of lake shore blvd and just east of Easterly WWTP. I dont wont anyone to block my sunsets. RECOGNIZE, put these things (hundreds of them, local built, out of upcycled steel) on some farm field some place. PS - I hear its 50% cheaper install in dirt, and its what GE likes to do. Submitted by Norm Roulet on Mon, 01/15/2007 - 10:40. We should be experimenting with all kinds of wind turbines around Cleveland - make that the "in" architectural element... there should be some all over the Cleveland Clinic campus - and the new County building - and around Cleveland Public power on the lakefront and the bluff along I90 - the Coast Guard Station... make that the wind study and learning center. Submitted by d_arnold@drupal.org on Wed, 01/17/2007 - 13:15. Cleveland does need to be a producer as opposed to being a consumer. Cleveland won't survive as a consumer city. Plus, it's not what this city is. I am sure that, with all of our brain power, we can be a player instead of a spectator. Submitted by Jeff Buster on Thu, 04/04/2013 - 22:14. 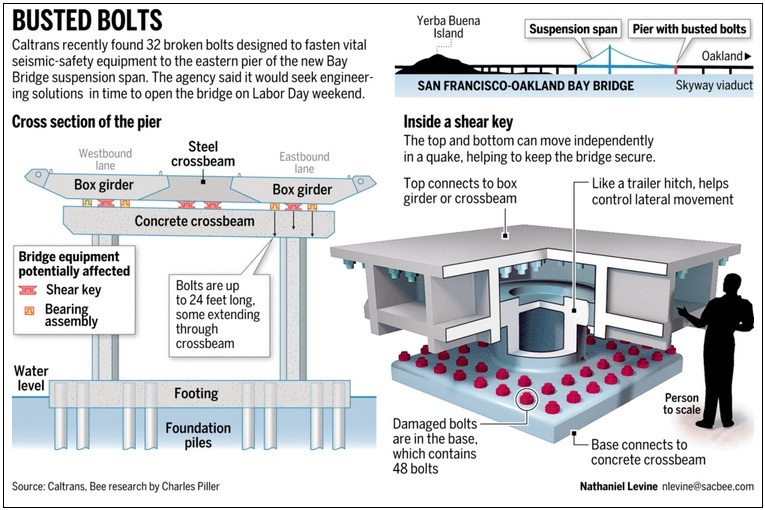 After the earthquakes, the Bay Bridge was a mess. Caltrans went for a total re-build. Dyson, an Ohio specialty bolt - rod - producer, claimed specialty work on huge bolts which connected the bridge to its foundations. Recently, Caltrans aknowledged that 30 or so of the 140 ish bolts supplied by Dyson had failed in service when installed.